Please note: STEM Expo requires all exhibitors to have some form of interactive STEM component to engage the students/visitors. If you have any questions, feel free to contact us. Limited Power (120VAC) is available at most booths. A single extension cord outlet will be provided to all booths except #18. Note that this power from shared outlets. The event begins at 9 am on Saturday. Exhibitor set up is open the evening prior (Friday, March 1) between 5 - 7:00 pm and the morning of the event (March 2) from 7 - 9:00 am. Please have exhibitor ready and staffed by 9:00 am (at latest), students/parents will be present in the area from about 8:00AM on. The event ends at 4:30 pm on Saturday (March 2) - PLEASE DO NOT break down until the awards ceremony has begun and is underway (Award ceremony begins at 3:30). WJU restricts us from driving any vehicles up onto the front ramp or within the Quad area. There is parking available (and easier access to the warehouse) directly east of the warehouse, in the 'Overflow Parking' area. The exhibitor area is located just inside the main entrance and into the theater area of the Academic Warehouse at William Jessup University. 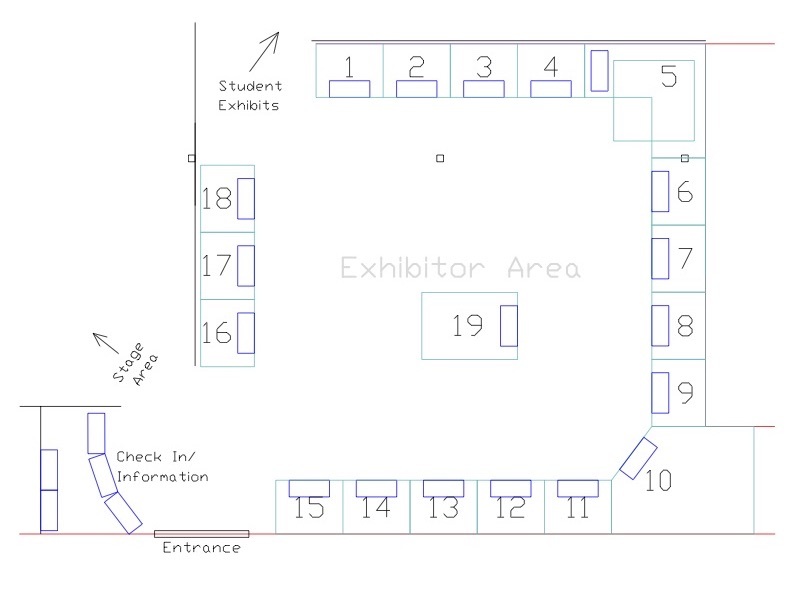 All student entrants and all visitors will pass by the exhibitor area on the way to the STEM Expo Student Entry display area and/or to the closing ceremony. Spaces are marked on the floor with no curtain or barrier separating them. It is recommended that exhibitors bring free-standing items if they wish to delineate the space further. We are asking that all booths refrain from any noisy activity (while tearing down or whatever) from 3:00 when Mad Science begins their show until the ceremony completes at about 4:30. Fees can be paid via check, online (below) via PayPal, on site by cash or credit card. Fees are due on or before the day of the event.